Sharanya Reddy and Frank Kero of PerkinElmer, Inc. and Matteo Meglioli of Mosti Mondiale describe the analysis of glyphosate in wine with no sample preparation using QSightTM 220 LC-MS/MS system with a ‘Stay Clean’ source. Glyphosate is an organophosphorus herbicide that is used on crops to kill weeds and grasses. Its usage has multiplied with the introduction of transgenic crops made resistant to glyphosate. Because of its rampant use, it is not surprising that glyphosate has been detected in a variety of foods. Recently, the International Agency for Research on Cancer classified glyphosate as ‘probably carcinogenic in humans’. In lieu of regulatory bodies setting limits on glyphosate in food, it becomes imperative to develop robust and sensitive analytical methods for glyphosate detection. Since glyphosate is a very polar molecule, it does not retain well on a traditional reverse phase column making it very difficult to chromatographically separate from other components and detect. Methods involving derivatisation with a hydrophobic moiety can help retain glyphosate on the column but also makes the process labour intensive and tedious. We present a study that involves direct analysis of glyphosate in wine on a mixed mode column with no sample dilution or extraction using a PerkinElmer QSightTM 220 triple quadruple mass spectrometer with a unique Stay CleanTM source consisting of a hot surface induced desolvation (HSID)TM interface and a laminar flow ion guideTM. Both the HSID and ion guide prevent any contaminants from entering the mass spectrometer, keeping it at its highest performance and thereby maintenance free. Wine samples were filtered through a nylon filter (0.2 μm) and spiked with known concentrations of glyphosate and its degradation product amino methyl phosphonic acid (AMPA) to set up a calibration curve. The samples (20 μL) were directly injected on an LC column (Acclaim Trinity Q1 100 x 3 mm 3μm) using the AltusTM UPLCR system fitted with the PerkinElmer QSight 210TM series mass spectrometer. Chromatographic separation was performed with gradient elution using mobile phases A (50 mM ammonium formate, pH adjusted to 2.9 with formic acid) and mobile phase B (acetonitrile). The glyphosate and AMPA were analysed in multiple reaction monitoring (MRM) mode. The MRM transition ions 109.7>78.8 and 109.7>62.8 were monitored for glyphosate and the transition ions 167.5>63 and 167.5>78.8 were monitored for AMPA. 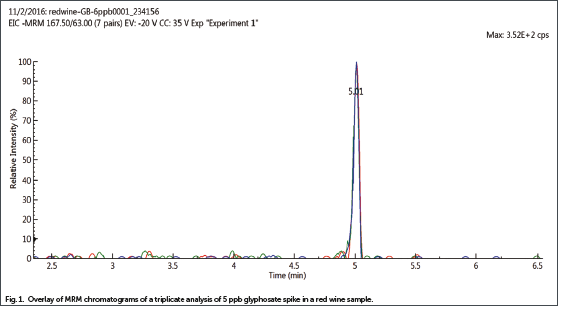 The glyphosate spiked in red and white wine samples was analysed in multiple reaction monitoring (MRM) mode and was easily detectable at 5 parts per billion (ppb) with no sample preparation in both red (Fig.1) and white wine. The signal to noise (S/N) of 200 obtained for the 5ppb glyphosate spike in red wine suggested we should be able to detect the analyte at concentrations lower than 5 ppb. The calibration curves of glyphosate and AMPA spiked in red and white wine showed excellent linearity (r2> 0.996) and the peak area intensity was similar for the analyte in both matrices suggesting that red wine, in spite of being heavily pigmented, did not suppress/interfere with the signal. The robustness of the ‘Stay Clean’ source was tested by analysing nearly 300 injections (20 μl each) of red wine. 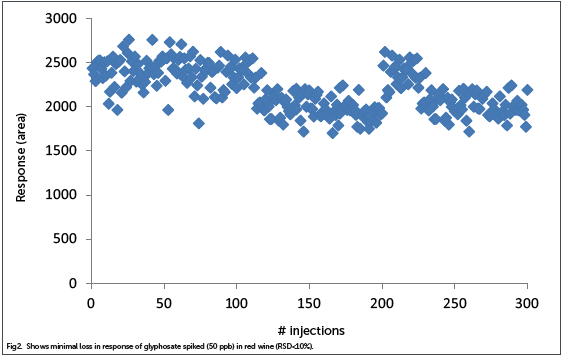 As seen in Fig.2, there was minimal loss of signal of glyphosate (RSD≤10%), indicating the source was robust to contamination from dirty matrices. The robustness of the source can be attributed to the HSID source and the laminar flow ion guide present in the QSight. The HSID is a multiorthogonal interface directly heated to 300°C that is present immediately after the sampling orifice in the source and connects the orifice to the laminar flow ion guide of the QSight mass spectrometer. Unlike traditionally designed interfaces, the HSID with its multi-channels orthogonal to each other produces turbulent and laminar flow and disrupts the free jet expansion of the sample ions. The orthogonal channels prevent neutrals from entering the mass spectrometer reducing chemical noise and any solvated charged clusters entering the HSID are entrained and desolvated in the hot flow of gas further contributing to reduction in chemical noise. The ions from the HSID interface are gently transferred by gas flow to the laminar flow ion guide, which is not subject to the traditional axial fields, but is at zero potential. The ion guide has multiple pumping stages to generate several pressure regions from the sample interface to the mass analyzer. In these regions, pressure gradually drops, creating a well-defined flow pattern along the ion path enabling ions to be gently extracted into the analyser. Both the HSID and laminar flow ion guide prevent accumulation of contamination along the ion path making the QSight maintenance-free. The many benefits of the HSID interface include high sensitivity due to an inherent reduction in chemical background and the ability to perform analysis at high LC flow rate (3mL/min) without reduction in signal. The QSight triple quadrupole mass spectrometer is fitted with a unique low maintenance source that allows for minimal sample preparation thereby resulting in increased productivity.